Ms. Deneen Francine Hall, 51, of Campbellsville, KY died on July 4, 2018 at Jewish Hospital in Louisville, KY.
Ms. Hall was a native of Campbellsville, KY and the daughter of Donald and Dorothy Hall. She was a member of Bethel AME Church. In addition to her parents, she is survived by one sister, Doretha Sanders (Matthew) of Campbellsville, KY; two brothers, Delonza Hall of Fort Wayne, IN and Dexter Hall (Tammy) of Mt. 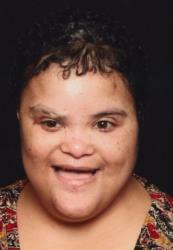 Washington, KY; eight aunts, two uncles; a host of cousins and friends; and a special caregiver, Raquel Evans. Funeral service will be held at 1:00 pm on Monday, July 9, 2018 at Bethel AME Church with Rev. Laurice Martin officiating. Burial will follow in the Crown Hill Cemetery in Campbellsville, KY.
Visitation will be from 11:00 am to 1:00 pm on Monday, July 9, 2018 at Bethel AME Church. Buchanan, Robinson & Percell Funeral Home is in charge of arrangements. We love you and will miss your awesome healing hugs.